Duty, Honor, Planet – Free Kindle Sci Fi Book – Free till Tuesday November 4th 2014. Former Marine Jason McKay thinks his first assignment as a Military Intelligence officer—as the head of a protection detail for a Republic Senator’s daughter on her humanitarian mission to the star colonies—will be a boring waste of time. Until Aphrodite, the agricultural colony they’re touring, is invaded by an inhuman enemy that may threaten Earth, and McKay and his people are trapped far behind enemy lines. Separated from his team during the attack, McKay has to try to keep Valerie O’Keefe, the idealistic daughter of a powerful politician, alive in the face of threats from an alien menace and a more mundane revolutionary front that is working to free the forced exiles from their servitude to the MultiCorps that run the colonies. Meanwhile, McKay’s second in command, Shannon Stark, leads the remainder of the special operations unit in a mission to sabotage the invaders’ efforts to loot the resources of Aphrodite. The small group of commandos also attempts to learn more about the true identity of the their enemy, who may not be as alien as they believe. Together, these two officers fight to survive, to protect the civilians in their charge…and to do their duty. 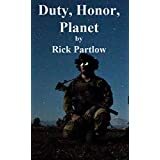 This entry was posted in Book Reviews and tagged Duty Honor Planet, Free Kindle Book, Rick Partlow, Sci Fi Fiction on November 3, 2014 by GunGuy.